I seasoned the breasts with salt, poultry seasoning and ground garlic, brushed them with oil and BBQ'd them. Plain old basmati rice made with salt and olive oil. The sugar snap peas I cut the tips off both ends and blanched them and cooled under running water. I cut a stick of celery into similar size pieces. Next I diced half a small onion and caramelized it. I added the celery and peas and heated it all through. A little salt and pepper and that was it. How do you make a sauce without a recipe? Taste it. This is about the easiest sauce to experiment with and get a decent result. I needed about half a teaspoon of sauce for each breast so I started with one teaspoon of honey. To that I added a 1/4 tsp of dijon mustard. Taste. Another 1/4 tsp mustard. Taste. Another little dab of mustard and I left it at that. Fern would have liked a little more mustard to temper the sweetness but he liked it anyway. 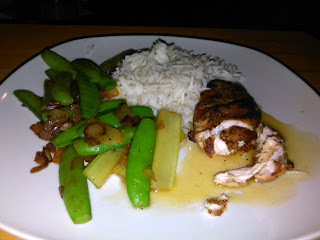 I over cooked the chicken slightly but it was still really good. Fern really liked the peas.